Biodegradable Polymers based on copolymers of polylactic acid (PLA) and polyethylene glycol (PEG) offer scientists new tools for controlled release formulations and delivery platforms. Polymer structures featuring polyethylene glycol (PEG), with biodegradable or biocompatabile segments offering micelluar, nano and microsphere morphologies which are useful for controlled release formulations. Molecular weights of blocks controlled by GPC. Alternative structures can be synthesized. A new class of polymeric biomaterials is emerging. 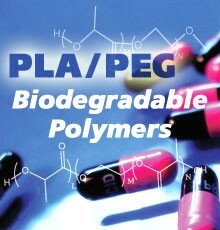 The biodegradability of polymers based on lactic acid(LA) and its copolymers with ethylene glycol (EG) opens up new avenues for drug delivery, gene therapy, tissue engineering and determination of cellular pathway mechanisms. Historically there have been three basic building block monomers for degradable polymers: lactides, glycolides and caprolactone. All are in clinical use and show varying degrees of degradability based on backbone compositions, crystallinity and molecular weights. Lactic acid is a “chiral” molecule having both (L) and (D) forms with (L) being the common metabolite. The family of lactic acid polymers includes the pure poly-L- lactic acid (L form of PLA), the pure poly-D-lactic acid and the poly-D, L lactic acid (DL-PLA). Many other useful compositions occur when the polymer is organized into diblocks with ethylene glycol and/or glycolic acid comonomers or triblocks with ethylene glycol and/or glycolic acid. Polymers of this type are insoluble in water but degrade by hydrolytic attack on their ester bonds. This degradation can be mediated by selective choice of comonomers such as ethylene glycol which enhance the penetration of water and rate of hydrolysis.